As the consumer electronics industry struggles to work out what people want in wearable technology, the people are speaking. 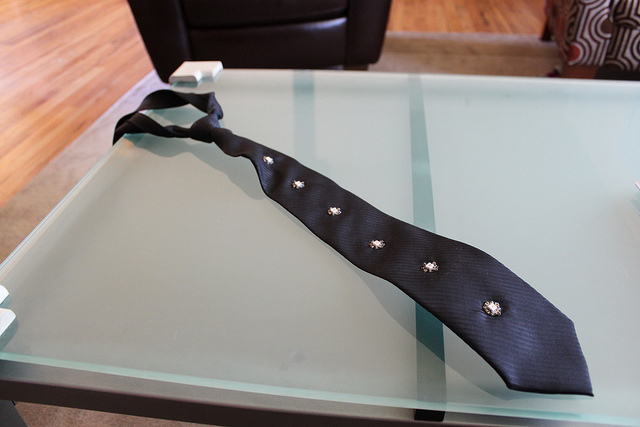 We want – no, need – neckwear that lights up in sync to music as we play. Clearly. Well, anyway, that’s what Hector Urtubia – aka Mr Book – is doing in his latest hack. It’s a proof of concept, but it’s good, nerdy fun. And it uses mesh networking and conductive thread. Pinoccio (yes, spelled without the ‘h’), an Internet-connected, compact, Arduino-compatible board. You can even access this board over the Web, so think Internet of Things here. Sounds crazy. Is actually crazy. But you could use this hack as the basis for any number of other ideas, too. Hector’s blog details the technical process, points to some free code, and suggests some of the other applications beyond music. If you’re thinking about toying around with LEDs, Internet-connected inventions, MIDI, or wearable tech, you’ll want to take a look. And with these interfaces getting smaller and more connected, you may be surprised that some of those applications prove useful. I just want a keyboard necktie I can play next.